Rediff.com » News » Where did the statement vanish?! Where did the statement vanish?! The attempts to unearth the document started getting more and more frantic. The clerks began to flip pages of files full of documents, some hand written, some bearing thick seals or multiple stamps, some in Hindi, some in Marathi. Several junior lawyers joined in, perusing different files and dockets. But in spite of the best of efforts the document was not to be found. Do you know that feeling, when at the nail-biting climax of a cricket match or a mystery murder film, the cable signal suddenly goes or the WiFi (in the old days it could have been the electricity) and you are left contemplating a dead, blank screen, as your adrenaline drains out through your toes? 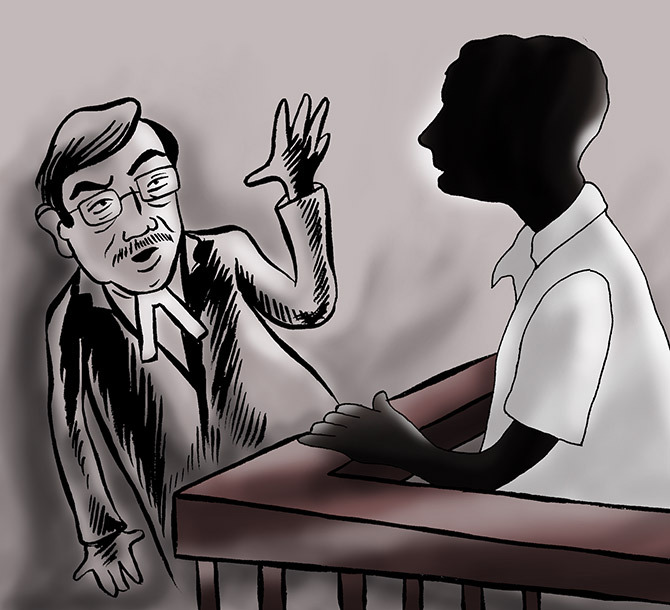 The Blank Screen Phenomenon happened this Monday, August 7, at the Sheena Bora murder trial, unfolding at south Mumbai's sessions court, in CBI Special Judge Jayendra C Jagdale's Courtroom 51. Accused No 1 Indrani Mukerjea's defence lawyer Sudeep Pasbola had been cross examining Shyamvar Rai, the Mukerjeas' driver and now approver. Like Friday, August 4, the feisty advocate bombarded Rai with exacting question after exacting question, which Rai answered with his stockpile of now-predictable "yaad nahin"s.
Net result: Pasbola was slowly constructing a picture of a bumbling driver, who neither knew the roads he drove the Saab and Madam on, or his finances, nor could he remember basic details like what cell handset he carried or how many days in a month he worked after he left the Mukerjeas' employment. Like Friday too, Rai seemed to prefer to play the dimwit illiterate bechara driver, Pasbola was making him out to be. A man who, mostly, knew just four words -- maloom nahin/yaad nahin". When Rai arrived, from the Thane jail, at the witness stand, wearing a grey bush shirt and dark brown trousers, he was not looking as fresh as a daisy. Rather wilted instead. He whispered across to Judge Jagdale something about an upset stomach and how he hadn't been feeling well, to which the judge said to alert him when he felt worse. When there were delays in the proceedings he sat back on a stool, kept in the witness box, at one point closing his eyes as if exhausted and wasted. Every simple question addressed to him he treated as if he was being asked a complex algebraic formula. Thinking long and hard, deep mystification would unroll across his face, before he gave a non-answer. The verbal fencing continued. Pasbola, the master dueller was not wasting an opportunity to attempt to push his delicate épée home, if he could. Pasbola: You had a credit card from HDFC bank (Mumbai) in 2008? Rai: Ghar par tha, ya mera paas tha, yaad nahin (whether the card was with me or at home I don't remember). Pasbola: You paid the bills for this card? Rai: I paid them from time to time. I don't remember clearly. Pasbola: So you took another SIM for the new phone number you got? Rai: Liya hoga, shayad (I must have taken probably). Pasbola repeated loudly: Liya hoga shayad (I must have taken probably)?! Pasbola: On the day you were arrested (by a Khar police constable for illegal possession of a firearm on Carter Road, Bandra, north west Mumbai) was your cell working? Rai: (thought for a long, long time) Chalu tha (it was working). Pasbola: On the day of your arrest you were coming from your home in Vakola East. What bridge did you use to cross over from the east to the west? Rai: (Thought and thought) Yaad nahin (I don't remember). Pasbola: You are a driver who lives in Vakola East. Have you driven on Carter Road before? Rai: Sab jagah gaya hai, pura Bombay (I have been everywhere, the whole of Bombay). Pasbola: Is there a lot of traffic usually on Carter Road? Pasbola: When was the last time you spoke to Indrani Mukerjea? Antim baar aap unka aavaj suna (the last time you heard her voice)? Rai: Yaad nahinm (I don't remember). Pasbola: Rubaroo (face to face)? Skype? Phone? Pasbola: Did you get three months of pay compensation after you left their employment or before? Rai: Yaad nahin (I don't remember). There was a curious verbal scrimmage over what Rai was trying to dispose of the day he was arrested. He said it was a pistol and cartridges and referred to them as two separate items. When pressed on whether the cartridges were inside the gun he said he didn't know. When asked if had bothered to cover the gun he was taking through "har, har bazaar" (Rai objected to that description) with maybe a pair of pants or a shirt or a sari, he said it was already in its own wrapping. But he didn't know and didn't check what was wrapped around the gun that he carried in the plastic bag, whether it was a paper, newspaper, an envelope, wrapped in string or tape or anything. But this was the gun he had with him -- he said in his testimony -- since 2012. And where was he planning to throw the katta and cartridges? Rai: In the Carter road jhar (bushes). Indrani, from the back of the courtroom laughed uproariously, though silently, turning to former husband Sanjeev Khanna in amusement. But in spite of the Rai-created speedbreakers in the flow, Pasbola slowly led him linearly through questions relating to his arrest. Was he carrying a cell phone that day? What else was he carrying? What distance had he traveled before being intercepted by the police constable? Pasbola finally drove the line of questioning towards probably The Question of the day's session. "Did it ever happen, that at any point, you asked Indrani Mukerjea for money and she didn't help you?" Quite unlike the other questions, Rai only momentarily paused, hearing this question and denied it dismissively, with a why-would-I expression firmly on his face. He then complained of cramps and sat down on his stool. Pasbola again asked the same question, reworded, gruffly, "Did you tell the police at the Khar police station on August 26, 2015 that you had demanded money of Indrani Mukerjea?" Again Rai categorically said no. There were clearly no "yaad nahin"s or "maloom nahin"s this time. It was an equivocal no. That's when Pasbola pounced like a cat who has finally caught his prey and was about to toss it in the air. "But in your statement to the policemen at the Khar police station you said you had asked money of her. I will show you your statement." And that's when the Blank Screen finale of the day occurred. Pasbola requested the court to fish out Rai's statement given during interrogation at the Khar police station so he could dramatically confront him with it. The two lady court clerks, always attentive and efficient to anything the court required, be they the dust-laden horrid shoes used by the accused or a special letter, began quickly flipping through the files of the case, they had kept ready on their table that faced the long lawyer table. Meantime Courtroom 51's tall, white-unformed peon came over with a plastic box of keys. One of the clerks, dressed very festively for Nariyal Purnima, in a green and gold sari, pulled out an appropriate key. The peon then got onto the dais, where the judge sits, and began prowling around to locate the right trunk. Courtroom 51 is lined with stacks and stacks of ugly trunks and dusty bundles of papers in addition to grey, bleak-looking almirahs that give it a musty, shabby appearance. Since, over the years, the papers stored for various cases must have multiplied probably tenfold, the population of trunks and cupboards has expanded and marched upstairs to invade and occupy half of the judge's dais too. From a trunk on the judge's far right, the peon fished out a large bundle of papers wrapped in a white cloth and brought it to the clerks. It opened to reveal about 30 files. Then began the laborious process of flipping through each of these files. Two rounds of sifting through the files, over 20 minutes, did not unearth the crucial No 161 under the Code of Criminal Procedure (external link). By then the judge, who was watching the operation closely, was looking mildly impatient. Pasbola suggested they could perhaps continue and the document would show up. Photocopies of the same document was already in the hands of all the lawyers present, including CBI counsels Bharat Badami and Kavita Patil, wearing today a black chiffon sari, edged with white lace. But presenting the original was an essential part of formal court procedure. The clerks, who seemed mildly upset, began to flip pages of files full of documents, some hand written, some bearing thick seals or multiple stamps, some in Hindi, some in Marathi. Pasbola had already mentioned last time how another document, the letter that Rai originally wrote to the kila court magistrate -- which another lawyer described as a scrappy bit of correspondence written, hastily, in Hindi, on the pulled-out page of one of those school copy books -- asking for permission to meet her, to confess his crime, was also not on file. And had allegedly disappeared. Pasbola did not make a big to-do about that one. This statement was, of course, required. Judge Jagdale asked of Patil, irritated, looking over the top of his spectacles, "Do you want me to suggest it is a fabricated statement?" The prosecution offered their quick denials, saying the document indeed existed but was not required in the chargesheet and hence its absence. "It should be there!" Badami said. It also transpired that CBI Investigating Officer K K Singh, who they call the IO, was not in court and he might know better where this document was stashed. It was concluded that either the Khar police station still had it or the CBI knew its correct location. Once Singh returned from Delhi on Thursday, where some urgent work had taken him -- CBI officers shuttle about like carrier pigeons, nursemaid-ing a variety of cases at the same time -- he would know where this vital document was and the case could proceed again on Friday, August 11. Judge Jagdale directed that it be tracked down by the CBI and the police. Proceedings closed marginally early, just as it was inching up to 5 pm. The three accused retired to the hallways to go over the notes they had taken from the accused's enclosure and examined papers with their respective lawyers. The hallways and its benches had been rather packed on Monday, right from the morning on account of the next hearing of the Somali pirates case, this time another group of 16 pirates in The State Yellow Gate Police Station vs Abdul Nasir Abdula and Others hearing. This motley, rag-tag bunch had also been awarded, nearly seven years later, a seven year sentence by Judge Jagdale and were stamping, thumb-printing and signing documents converting them from undertrials to convicts. It was quite a noisy melee, as the pirates, many handcuffed to each other, swarmed about, chomping on Parle biscuits and sipping drinks and jabbering in Somali, although they do know some Hindi (a colleague mentioned how once, some time back, one of them had said to her: "Ay ladki gutka hai?"). Both Indrani, in immaculate white, including a white bindi, and Sanjeev, in a blue checked long sleeve shirt and trousers, carrying an orange bag, sat working on details relating to the Khar police station interrogation. Rai was seated a little further, with three police escorts, his droopiness all but vanished as he sat sipping chai and perkily chatting with the CBI prosecution, his face wreathed in smiles, exhibiting a completely different outside-the-courtroom persona. 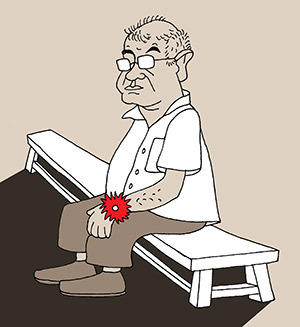 Peter Mukerjea, who looked dejected or maybe exhausted, was sporting a bit of colour -- a red rakhi on his left hand that his fond sister Shangon Dasgupta must have given him. Inside Courtoom 51 the clerks were winding up the paperwork and putting away all the extra files. The suitcase, that had been a trial item of display (it had been bought allegedly for the body of Indrani's son Mekhail Bora, who was not murdered) in the hearing on August 1, was also sitting there in the courtroom. Someone asked the CBI folks how they expected people to believe that Mekhail could ever have fit in that small a suitcase. One of the CBI team announced, "Just wait till Friday. I will demonstrate to you, when I climb into it myself!" We can't wait for Friday. How did Indrani get the hair dye?